There is a festival feeling in Ashbourne with town proclaiming the day with bunting. An odd festival feeling with all the shops and houses on the main streets boarded up that is. That said, this is not a war zone but everyone is excited and in the nearby hall a big meal is being held. 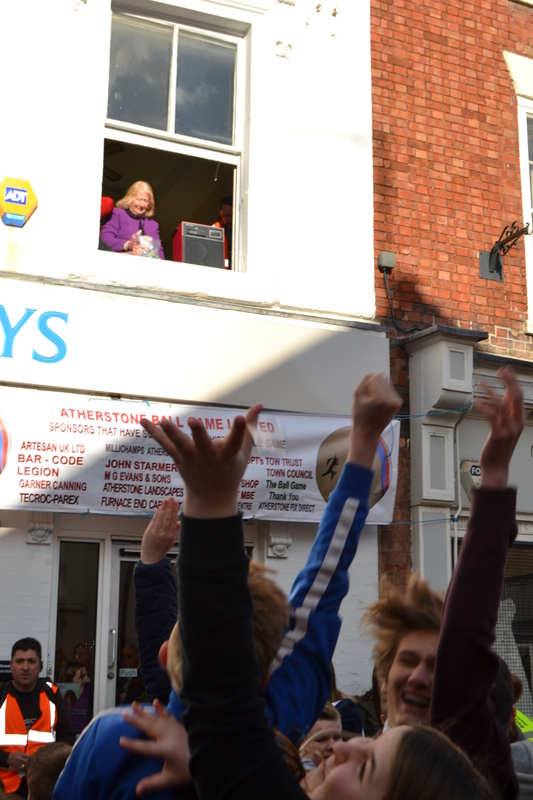 The crowds await outside. 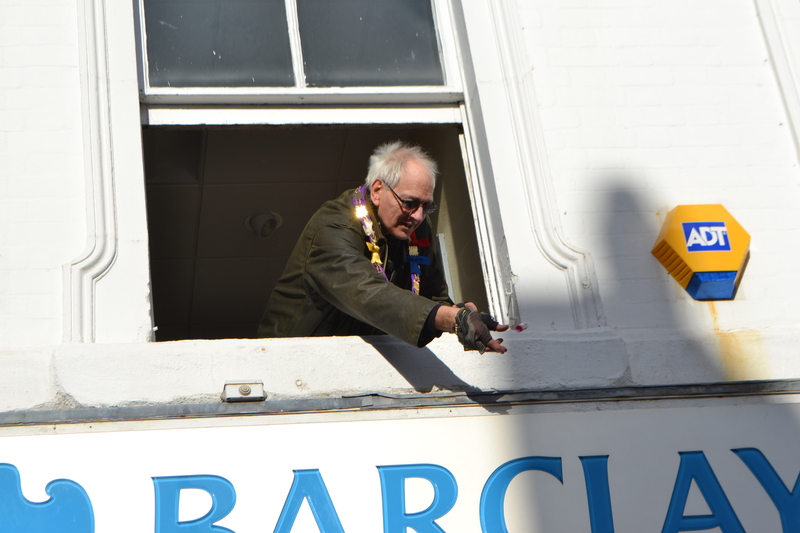 Then after some rapturous applause. Like most mob games football is a bit of misnomer. It was hugged, punched and rolled but rarely kicked. Once I stood there motionless, like a rabbit stuck in headlights, as the ball rolled towards me and between my legs. A few seconds later a mass of men came my way shouting ‘get out the way’ or something like that! I soon jumped to the side and the ball disappeared under a mass of writhing men. 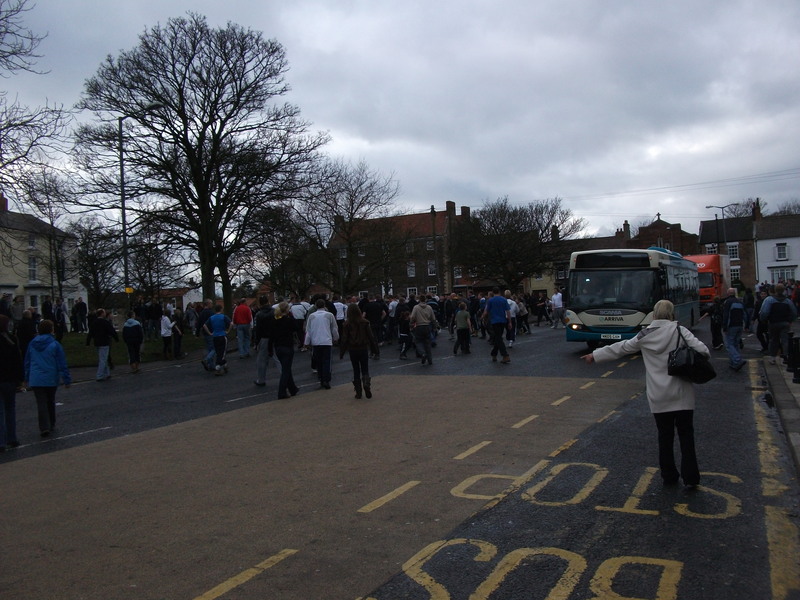 It all starts rather incongruously in a car park at the back of the shops…in truth the only large space in the town. Here is a large platform, redundant for 363 days, but today no card but people. Tourists look over from the edge, in the centre excited and waiting. After the aforementioned announcements as above, the ball was thrown in, or turned up in the local language….and of it went over the heads of the crowd and then disappeared into. 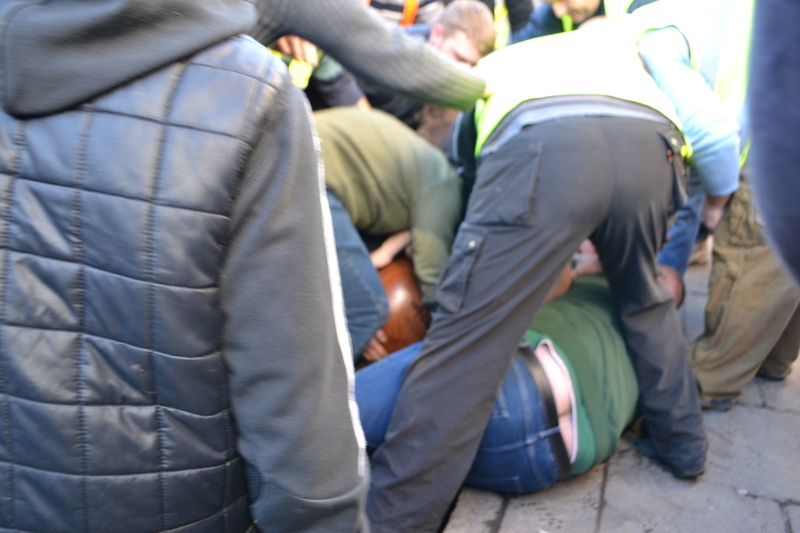 The scrum held for a while, someone broke through and then went into the cemetery! As soon as the ball was retrieved from the cemetery it found its way into the pool beside the park. At first eager members tried to use the branches to precariously perch themselves and lean over the water to get it…I winced…had they not seen the public information films from the 70s…and then plop in the water. It must have been cold..one then two, then three risked the cold depths. Soon there was a struggle for the ball in the water and then a cheer as it was hit skyward. Not enough. Again the town divides teams into two geographical locations: Up’ards (north of the River Henmore) and the Down’ards (south). 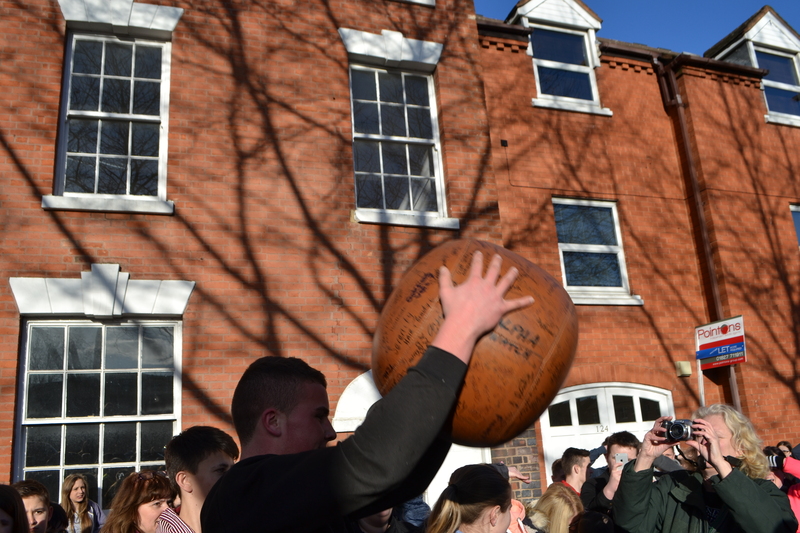 This was clearly a necessity to get a team together back in the day but nowadays anyone joins in and it’s a bit irrelevant..
One interesting theory states that the ball was originally a severed head thrown into the crowd after an execution – it seems unlikely to be honest! What is also unusual is that this is a two day game each day starting at 2 and going on until 10.00pm; but if the ball is goaled before half five it starts all over again! They do like their game! This goal consists of hitting the milestone this goal three times…when done, always under the cover of darkness, cheers erupt and the winner is carried on the crowd’s shoulders back to the pubs in the town. I’ve never made it too the end mind. The cold keeps putting me off! 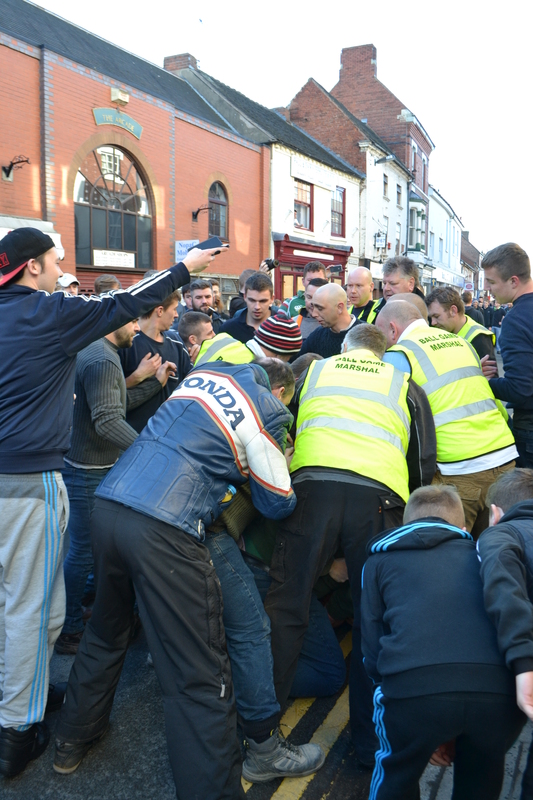 They are made of tough stuff in Ashbourne. One of the theories purported for the origins of the custom is that it commemorated the expulsion of the Danes from Leicester in the 10th century. Although unlikely a connection with the Danish custom of Hocktide is perhaps more likely as the custom involved the extortion for money as well. – two pence which many gladly gave! However, the date is confusing! 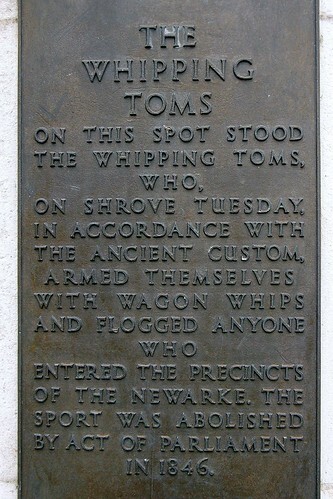 On the 16th February 1847 an Act of Parliament officially ended it and the last Whipping Toms put up a valiant fight – quite literally – but it was gone. Today the only record is the plaque on one of the corner pillars of the railings surrounding the De Montfort University’s Hawthorn Building. Such an origin, probably confused may hint at earlier pagan origins. 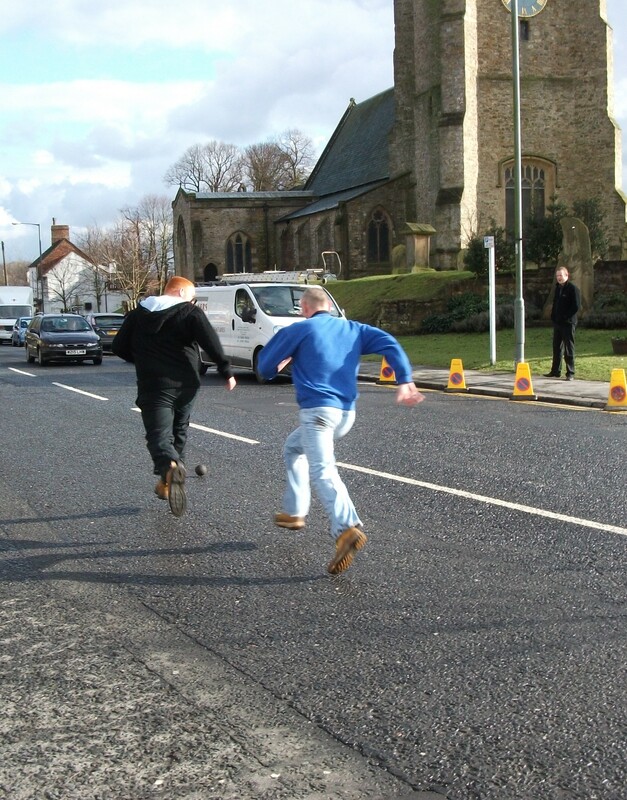 As indeed does the most common legend which states that it started in 1246-56 when the church was being built, the game ensuing between the craftsmen were occupied with its building and the local farm workers when the rector threw the ball at noon. Despite all this claimed heritage the earliest mention is in 1802 in the Sporting magazine. Although, a later account by William Parson and William White states that it is an ancient custom and relates the role of the parish clerk who provides the ball providing some evidence for the legend perhaps or origin. The first explanation may have some grain of truth for over the years the game has been known to have changed and fought in teams. Now it appears to have no teams but two goals were indentified until the 1920 which were for the two opposing teams, town and county. The town goal being a stream running along the boundary to the south and the county a pond a few hundred yards north of the town centre. The location of the goals, the county one being nearest to the town may hint at its age, recalling a pre 1636 date when farm workers would have lived within the town walls for protection. Post 1920s the rules changed, the county goal was filled in when the blacksmiths nearby became a petrol station. This meant only one goal survived and the game was no longer divided into opposing factions. Now individuals or groups compete making it even more exciting as you do not know who is going to win! It was a bright but cold day, I arrived at noon, no one was there, The church bell rang, a local noticing I was looking a little perplexed, informed me that this was the pancake bell, rang to encourage the locals to prepare them, and no doubt to fill the stomachs of the participants to warm them up and sustain them. 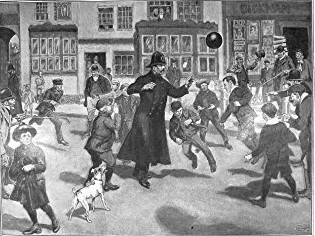 An hour later a man appeared carrying a small ball, it was much smaller than the other ‘footballs’ from similar games and soon a scrum surrounded him as he stood over the bull ring in the Green. 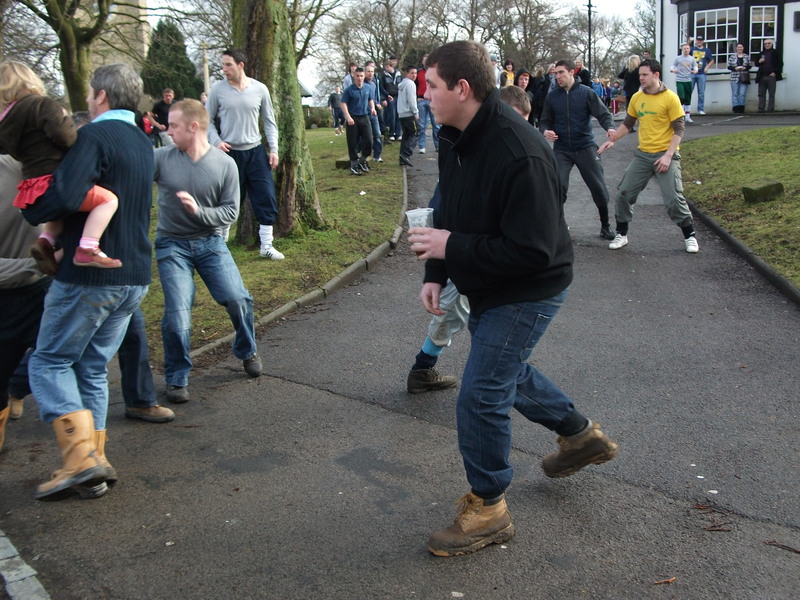 Of all these street games, this is the best one for the spectator, the ball is often kicked and the village green large enough so as not to feel claustrophobic, although it is difficult due to the ball’s size to work out exactly was in going on, the roars and shouts more than make you aware of its progress as long as it doesn’t disappear!